Grandfathers is a heart-warming story of grandfathers and grandsons told in two parts. The first part is set in 1946 and relates the experiences of five-year-old Billy Johnson with his grandfather. The second part is set in 1996 and tells of Billy's experiences with his own five-year-old grandson. What a difference 50 years makes! It was a touch hard to get into Grandfathers, as James H Kiser didn't quite do it for me. That said I think this book benafitted heavily from being the first thing I listened to after trying to enjoy kafkas the metamorphosis. After that, the gentle tone and kind nature of this book might as well have been aloe on a burn. Its not long or in depth, but I liked how this book basically told the same story twice only with one character being a grandson and a grandfather. Some things may change, and the world may move forward, but some things will always be the same. That in and of itself was wonderful. great narrator. loved the stories of being a grandfather. enjoyed it. the different generations. helps me remember things from my childhood. John Isaac Jones is a fabulous storyteller. His tales are always thought provoking. This short story opens with 5 year old Billy Johnson spending time with his grandfather. The second part of the story then shows Billy spending time with his own 5 year old grandson. It's interesting how things can be so different yet the same. Grandfathers by John Isaac Jones is one of his signature short stories that is just brilliant. I believe this is now the third one I have heard and they have all stuck with me in some way but for different reasons. This one due to the relationship I had with my own Grandfather for too short of a time. To keep this spoiler free I will just say that I highly recommend the audiobook. The narration is provided by James H Kiser. Mr. Kiser does a good job on this short performance. I enjoyed his work and would like to hear him on a longer audiobook. 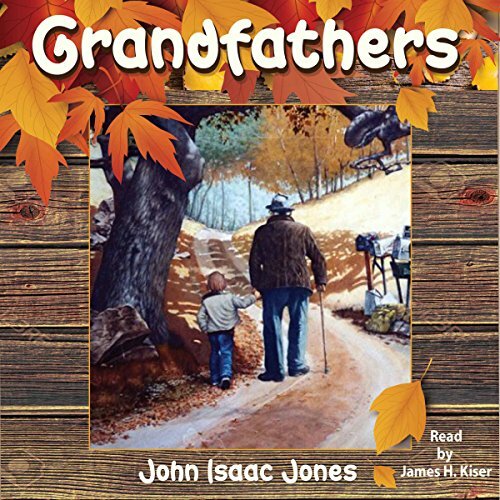 Grandfathers, by John Isaac Jones, narrated by James H Kiser. This is lovely book about grandfathers and grandsons. The book is full of love. The book starts in 1946 and continues in 1996. I liked the book very much. It associated me a lot on my relationship with my grandparents which is really close. John Isaac Jones did an excellent job again with this book. Very heartwarming story. Flow in the book is nice, the plot interesting. Really reminded me of stories my grandfather used to tell and time we spent together &lt;3 Liked James narration. Nice voice, his tone of voice brings the characters to life. One hour of duration is just my type of length. I really enjoyed this book. I would recommend this book to anybody. At the risk of sounding repetitive, I really enjoyed this book! I have listened to several of John I. Jones’ stories and, I have loved each one. Mr. Jones is a such a skilled storyteller; he has a way of walking you down your own memory lane while listening to his stories. I’m looking forward to the next walk! I received a review copy at my request and voluntarily reviewed. A very endearing short story of grandfathers and grandsons that spend time together. In the first part the grandson learns life lessons that he passes to his grandson in part two as the grandfather. The listener sees how times change yet stay the same. I enjoyed this short listen, very much. The narration was well done. The characters were well portrayed by James H Kiser. Loved this little story about a grandpa and his grandson and then about the grandson and his grandson. Fun intergenerational trip down memory/imagination lane. There is a folksy nostalgic quality to all of the stories I have heard from this author, and this narrator serves the story phenomenally. If you have a grandson or if you have ever been a grandson or if you would enjoy peeking inside of the interpersonal dynamics of two sets of grand father to grandson relationship, this book is for you. This story is really a pair of stories of multi generational life lessons. The parallels between the 2 timeframes were predicable but that's not a bad thing. And there were enough differences to keep it interesting. What doesn't change over the years is more interesting to me than what does. Technology and trends change but a 5 year old boy is still a 5 year old boy and an old man is still an old man. A 5 year old is filled with curiosity about the world, has unexpected big questions about life, and wants to be more grown up. A grandfather wants to pass down his wisdom and guide the next generation. The narration was good although I admit I've heard better from him. Still enjoyable though. Grandfathers is a short story about a five year old boy visiting his grandfather for a few days, and that same boy 50 years later, spending time with his own five year old grandson. While the toys, idols, and games have changed over the years, the wisdom imparted by the grandfathers is the same. And the love each child has for them shines through. This was a well written short story that's sure to bring to mind some of your favorite memories with your own loved ones. The conversations between the pairs made me smile. Little boys stay little boys, even over different eras, and grandfathers are just as patient and kind in 1946 as they are in 1996. The author writes in a straightforward way, and it was an enjoyable listen. The narration was done well, with a natural tone and delivery. I requested a copy of the audiobook, and I'm voluntarily leaving a review.